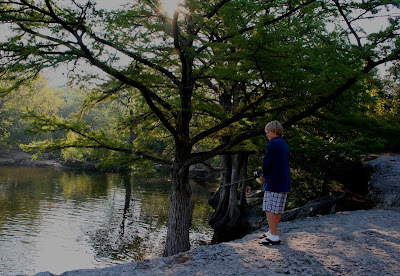 Sam fishing at Onion Creek in McKinney Falls State Park where we camped this past weekend. We fished a bit on Sunday morning and he caught one largemouth bass and let it go. It was about a foot long. 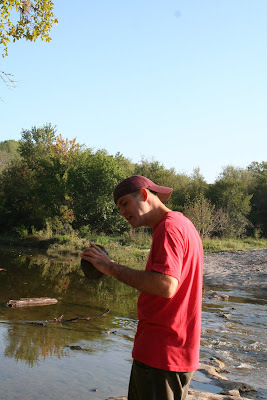 Sam had hoped to do more fishing and to fish in a clear stream like the San Marcos (where we tubed the day before) but I didn't realize Onion Creek wasn't a clear stream like the San Marcos, Comal etc. Next time! This past weekend I took Sam, his friend Brent, and Doug to the Texas Hill Country to camp and to tube down the San Marcos River. I hadn't gone tubing since I was in high school which was waaaay too many years ago. I had only tubed down the Guadalupe and Comal Rivers, both of which are nearby so this was a nice new adventure. There has been a major drought in the area, so the water level is low, and the flow was slow, but a big surprise awaited us at the end of the 40 minute or so float... a set of 3 created rapids, and drops, which were sooo much fun! You could go as many times as you wanted. When we got to the end, we went down the rapids with and without tubes several times, and then after a while, we took the water taxi back to the beginning where we floated one more time down. 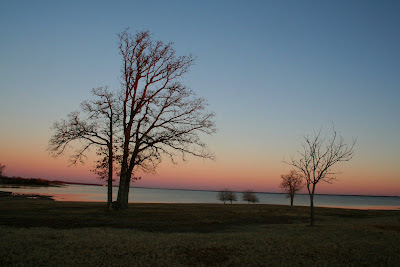 It was absolutely perfect tubing weather - nice and hot - which is good because the water is chilly especially at first! It's certainly not near as cold as, say, California's Merced River in Yosemite or any glacial fed lake so I told Sam to buck up and jump in! Once you're in it felt great. After we floated down twice, we dried off and went to eat at the San Marcos River Grill & Pub, which sits on the river right overlooking the rapids. I'd smelled the burgers while tubing on the rapids and it made me hungry for burgers!! We sat down in the open bar area overlooking the river and the service was sooooo slow, and I had to basically get everything myself (literally the bartender was the only waitstaff for about 25 people)... BUT the food was great! Then we headed back to the park and crashed. Oh Sam made a small campfire and Brent & Sam made S'mores but I wasn't even hungry anymore. In the morn we went fishing a bit and then headed home. The kids had a great time tubing!! It was to celebrate Sam's 13th birthday which was a couple weeks ago. Tomorrow I leave for Bozeman, Montana - I can't wait! Oh, we used a waterproof camera to take some tubing pics and I'm going to pick it up later from the photo place so hopefully I'll upload a couple of them too. Your good thoughts and prayers are much appreciated for me while I travel and WRITE my book the next weeks! A view of the falls at the park. Sam hooked a turtle, and Doug removed the hook and we let it go! 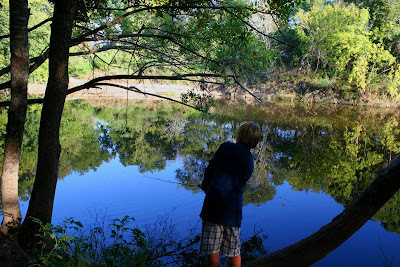 Sam fishing on the bank of Onion Creek Sunday morn, near some large bald cypress trees. Another view of the falls on Onion Creek. 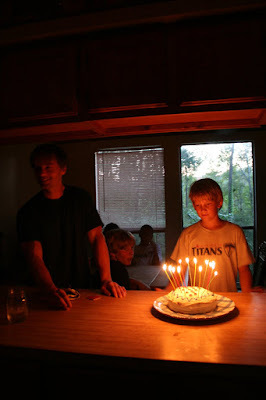 Sam and his daddy at his 13th birthday party last weekend. A quick update just so everyone knows I haven't fallen off the face of the planet! We had to reschedule the camping and tubing trip from a couple weekends ago to this coming weekend due to rain... the Texas Hill Country desperately needs rains to replenish its aquifers and nourish its wildlife and so forth but we were a bit sad... the weather was so warm back then and now it's started to cool down. Normally you'd think, ok, that is a good thing for camping right? But the thing is... and this is a minor thing, really, but the San Marcos River emerges from a spring and stays right around 72 degrees, which is a bit chilly. It's perfect when it's blazing hot out but when it's 80 or 85 as it will be this coming weekend... well that may be a bit cold on the toesies (and behinds). But we will have fun anyway! Sam is bringing a friend of his and Doug is coming too. 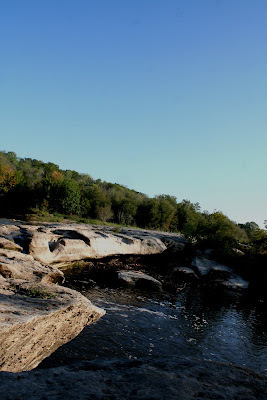 We plan to do the same basic thing I mentioned before- camp at McKinney Falls State Park and tube down the San Marcos River. Yea! Hope I can upload a couple pics afterwards but the reality is I may not be able to for a while, as I leave on TUESDAY for yet another trip! And yes, as you can imagine I am totally inundated, overwhelmed, swamped, and basically going crazy. I have two bags packed for different trips, trying to back up my computer and print things I'll need for the plane trip, taxi the kids here and there (school, soccer practice, cross country practice etc) me to the gym, and write and research as many blog posts as I can SO that I can focus on one thing during the next 3 weeks while I'm away... writing a couple chapters in my book!!! Aye yi yi. So where am I going you ask? Well, I have researched secluded getaways and friends' cabins for a couple years and after talking about it for oh months, years, I'm doing it! 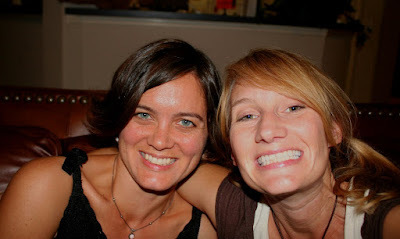 I decided to go stay with my friend Elissa in Bozeman Montana who is graciously opening her home to me to stay there! She has a basement (I think) that is like a self contained apartment so I'll stay there, work work work while she's at work (she and her husband own Sweetpea's Nursery) and we'll get to visit together in the evenings, and take a couple little excursions! Mostly I plan to write day and night! We plan to try to get to either Yellowstone National Park which is only an hour and a half away from her place (in Wyoming) or Glacier National Park which is 5 or 6 hours west, in Montana. I've been to Yellowstone twice and absolutely love it! I love the geysers and grand prismatic pool and the bison and bears... The last time I went was a decade ago with the kids and Matt on our way back from our insanely long drive to Alaska and back (we got to visit Elissa then too) and the other time when I was 14 years old and moving between Portland, Oregon and Minneapolis, Minnesota. 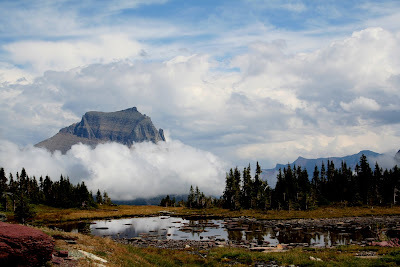 I went to Glacier a couple years ago with my dad, and if you're a faithful Bohemian Adventures reader, you may remember my blog post from then! I am writing a feature about pikas, and hope to visit with a biologist working on them at Yellowstone but that may not be possible... again you may remember Dad and I went pika-spotting in Glacier a couple years back (pics are at the blog post in previous link) with grad student Lucas Moyer-Horner and I will be writing up that experience in this article. Pikas are so cute! They are also threatened by global warming, and there's a petition into the US Fish & Wildlife Service to list them as a threatened species under the Endangered Species Act. I'll end this now, and hope to update a wee bit from Montana! Godspeed! 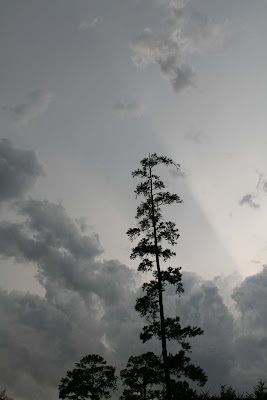 One year ago today (ie Sep 13th, though technically being after midnight it's now Sep 14, but we'll pretend it's still the 13th) - Hurricane Ike hit (see my Sep 2008 blogs for pics!)! It wasn't a scary storm where I sat in my nice brick house. But in my neighborhood and all around Houston it wreaked havoc! Particularly where I live there are lots of trees (though they're disappearing daily for subdivisions) and many of the isolated ones fell on people's roofs! I was very lucky that I had no damage other than a single fence thingie (what are they called?!). We had no electricity for someting like 11 days!! Again I was very lucky and blessed because my friend across the street (a majot street) had it from day 1! I don't know why she was so lucky, but the vast majority of Houstonians did not have any for days and weeks. I think she was on the grid with a hospital. Anyway, so I've lived iwthout electricty in my childhood so it was no big deal! And I had an absolute blast hanging out with friends and having a much more laid back lifestyle for a few days. It was a hurrication! 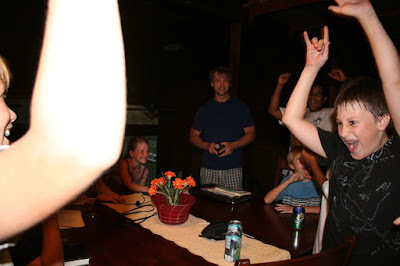 My son's birthday happened just after the hurricane, so he didn't even get a party... this year something happened again! Well his birthday hasn't happened YET but we had planned to go camping and tubing this past weekend but had to reschedule due to rain. Some may like it but camping in the rain is NO FUN for me, in a tent... yuk. Been there done that, no thanks. Plus tubing is also not so fun in the rain! So let's hope and pray that in a couple weekends from now, it will be sunny and warm!! "He believed that the love of his life, if he ever found the Right One, would fill all the gaps of his own personality. She dreamed that her perfect match would always respond gently, never willfully. After the honeymoon phase they naturally began to find imperfections and disappointments. Both wondered if they had chosen the Wrong One. But in a sense, there is no Right One for anyone. In another sense, there may be millions of Right Ones." Which is interesting because D&I just started this class on communicating in relationship based on Harville Hendrix's amazing book Getting the Love You Want. It's technically for married couples, and I had done a workshop on it with my ex, and honestly it was one of the few things that truly had a big positive impact on our learning to communicate better so since I do not ever ever ever want to get divorced again, so I want to make darn sure that I can resolve deep and painful and complex issues satisfactorily and peacefully... so I am excited about the class!!! And what we learned tonight (of course it's not new to me) was basically the same thing as I got in the email above. I believe that to truly love someone is not a feeling we have in ourselves, but an action we show to others. And in showing love to another person, we reflect the selfless love that Jesus taught and we became his hands and feet in the world to one another. 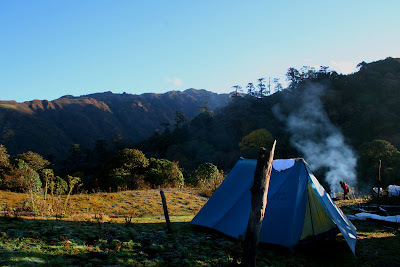 Camping on our trek through eastern Nepal, very close to the site where we spotted endangered red pandas. We stayed here for a couple days because our fearless leader, Brian (Exec Director of Red Panda Network) became sick! I wanted to post again since days are passing... lately I've been feeling very grateful, and have felt joyful again as well. It's not any one thing in particular, but just a spirit that seems to have come over me. One one level, I've always felt grateful, and have kept a gratitude journal on and off for years. But this feeling is different. I will see something very simple, like the t-shirts hanging in my closet and think, I am so glad that I have these clothes. I will make dinner for my kids and think, I am so blessed to have this opportunity to feed and nourish these beautiful, wonderful kids! I will wash dishes and think, I love a clean kitchen! Maybe that sounds silly, but it's true. I'm not sure where it came from, but it's yet one more thing to be thankful for - my thankful spirit right now! Here are some of things I'm very grateful for right now, in no particular order. Christy Nockels' and TobyMac's new songs, No Not One, and City on a Hill. My Animal Planet blog gig - come visit! I am truly enjoying cooking more again! I love and have always loved food, and the diversity of flavors! I am excited that I have started running again! I have a truly awesome career and love it! I had an awesome Saturday hanging out with my best friend Daline! I am grateful for all the diversity of wonderful friends that I have! I'm so happy for my dad to have found true love! I am thankful that Jesus was who he was. The way he lived, the things he said and did, and the selfless love embodied in his life blows my mind. I'm sure there are zillions of other things but these came to mind! In other news... 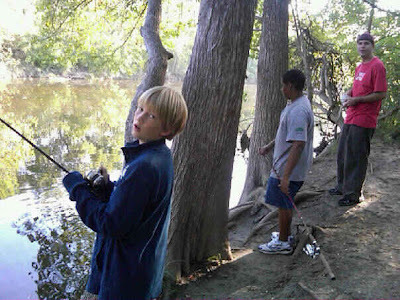 I'm taking Sam and a friend of his camping and tubing the San Marcos River for his 13th birthday! Another bohemian adventure!! The cool thing is that I haven't been tubing since I was in high school, which is longer ago than I care to admit... I used to love it though! 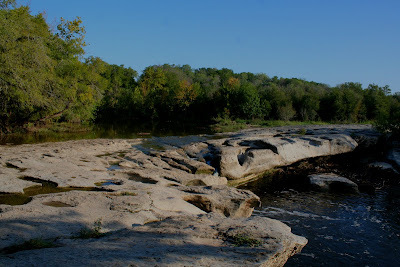 The original idea was just to go camping and fishing but it evolved.... We're staying at McKinney Falls State Park, just outside of Austin. It's one that I haven't been to yet but it looks pretty cool. There's a neat video of the park here. 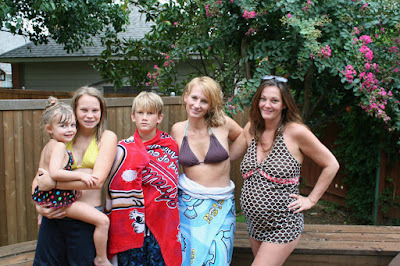 When I went to Dallas this summer with the kids, I visited a friend of mine who I went to high school with, Nikki. She is 7 months pregnant here with her second child which is due any day! She looks great doesn't she? My daughter is holding Nikki's daughter Abby. Sam never smiles for photos - he really is a happy kid! A photo Savannah shot of me at Nikki's. I like this shot! 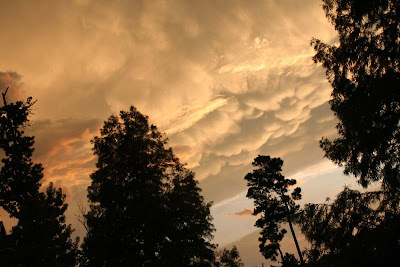 A photo I took outside my house of cool cloud formations. Another shot of the weird and cool clouds. Daline and I when she came to visit the other day! 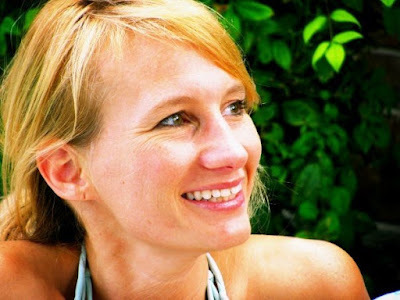 Check out her blog, Pixie Dust World Tour, and I especially encourage you to listen to the song "Here and Now" she has linked from the video at the top of the blog, which will blow you away - her voice and the song is truly beautiful. She's an inspiration! You can listen to her songs from the thingie below - click on the "songs" tab and then - my favorite "Here and Now."